Northern Energy Corporation has released quarterly activities statement for period ended 31 December 2007. Northern Energy Corporation will intensify its focus on progressing its Elimatta project with a new Resource Statement scheduled and a bankable feasibility study expected to commence in the current quarter. Northern Energy Corporation managing director Keith Barker said the Company was currently processing results from the extensive drilling programme completed at Elimatta in November. “We would expect to have updated the resource model and be able to issue a new Resource Statement shortly,” Mr Barker said. “Following completion of this and initial development studies drilling is planned to recommence in February with the objective of in fill drilling the identified initial mining areas to support the bankable feasibility study,” he said. A conceptual level study for Elimatta coal-to-liquid project scheduled to be completed by consultants GHD this quarter to enable comparison of alternative development options for the project. Yamala JV Stage 2 which commenced during the last quarter will continue as planned. Evaluation of options for development of the Maryborough project are planned for this quarter following postponement of the drilling programme last quarter due to persistent rain periods. An extensive drilling programme at Elimatta was completed in November. The initial mining and coal preparation studies are currently being finalised. Preparation for commencement of the Environmental Impact Statement and mining lease application process took place during the quarter. These will be progressed in the current quarter. Since the drilling program started in June 2007 a total of 67 holes have been drilled (54 cored and 13 chip) totalling approximately 5300m drilling and 2500m of core. In October the Company announced1 an increase in the Elimatta Resource. This upgrade from the previously announced Resource was based on information generated from an initial 20 of the holes in this programme. Information from the remainder of the holes is currently being input to upgrade the resource model and a new Elimatta Resource Statement is expected to be released shortly following receipt of product coal composite analyses. The core samples for the recent drilling programme have been subject to a detailed pre treatment, sizing and float sink testing programme to provide input to the coal handling and washing studies currently underway. A conceptual mining study is being undertaken to examine alternative mining scenarios. Both dragline and truck and shovel mine designs are being evaluated. In addition, a coal handling and preparation plant study along with supporting infrastructure studies have been conducted during the quarter. These are ongoing and will be completed shortly. Findings from these studies will then feed into the next drilling and analysis programme and form the basis of a feasibility study, which is planned to commence in the current quarter. While the initial studies are not concluded, the base case concept identified is an open cut operation with a notional saleable production of around 4Mtpa of single specification high volatile export coal. Following the completion of the dry season flora and fauna survey a soil survey was conducted around the EPC650 site. A wet season flora and fauna survey will be conducted in February. Background noise and dust, hydrological and other surveys are planned during the current quarter. A meeting was held with the Environmental Protection Agency in January as a precursor to the commencement of the Environmental Impact Statement and Mining Lease Application process. The application process is planned to commence in the current quarter. Following the approval of Stage 2 of the exploration programme by the Yamala Joint Venture in October drilling commenced at Yamala in December. Drilling was suspended for Christmas and recommenced in early January until it was interrupted by significant rainfall in the region and subsequent severe flooding in the Emerald region. While the Yamala target area was not significantly impacted by flooding access was restricted. Drilling is scheduled to recommence at Yamala in the first week of February. 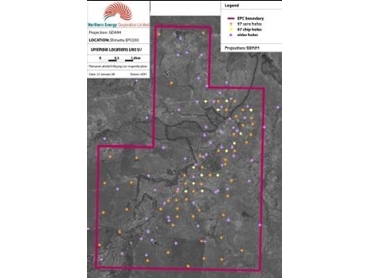 15 holes representing approximately 1200m of open hole and 110m core along with geophysical logging have been completed in Stage 2 during the quarter. he $2- million Stage 2 budget includes approximately 60 additional drill holes (approx. 6000m); coal quality and geotechnical testing; and some 20 line kms of 2D seismic followed up with 3D seismic over key areas. The underlying objective is to upgrade approximately 100Mt of the existing identified Inferred Resource area to higher Resource categories and subsequently to Reserves, following appropriate mining and other engineering studies. EPC1082 (Colton) covering the lower seam sub crops west of EPC923 has been granted for 3 years. Refer Figure below. The short drilling programme of both cored and open holes planned to commence in November was delayed due to consistent rain in the region throughout November, December and early January. Drilling is now planned to commence in February. The programme is designed to further test both the eastern and western flank of the southern end of the Burrum syncline. The programme will be extended to include the lower seam sub crops in the new EPC1082. As previously reported, discussions with various parties regarding transport infrastructure options for any mine development at Maryborough have taken place and a number of options have been identified. One of those options is a barge operation between the mine and the port of Bundaberg. A consultants report on the technical and economic viability of such an operation was commissioned during the quarter and will be concluded shortly. The 8 inch core drum sample for coke testing in Australia and Japan was extracted immediately prior to Christmas. The sample was processed in the first week of January and produced a product with 7.0% ash, 7.5 swell with 365 ddpm fluidity. Approximately 180kg of the product has been air freighted to Japan for the Japanese drum testing programme. The results of further coal and coke tests will be released when they are available. Two additional RC holes were drilled while the drill rig was on site to test thickness anomalies near old holes without geophysics. It is intended that these results will be included in the resource model and a review of the Ashford Resource will be undertaken with an intention to upgrade the Resource category. An assessment of the potential of a coal-to-liquids processing plant using Elimatta coal was completed and concluded that the Elimatta coal had excellent characteristics for coal-to-liquids technology in addition to its attractive combustion characteristics for power generation. During the quarter the Company held discussions with Central Queensland Port Authority (CQPA) regarding access to Gladstone for shipping coal produced from Elimatta, Yamala and, potentially, Maryborough. CQPA is planning the construction of a new coal terminal at Gladstone – the Wiggins Island project which, combined with a link to RG Tanna Coal terminal is planned to provide up to an additional 90Mtpa shipping capacity. In January, the Queensland Government announced the approval of the Environmental Impact Statement for Wiggins Island. CQPA has indicated that shippers requiring port capacity at Wiggins Island will be asked to assist the funding of the final feasibility / engineering design study for Wiggins Island. Participation in this arrangement will provide an opportunity to obtain capacity in priority to a non-participant. Full details of the financial arrangements and obligations are yet to be received however subject to a satisfactory arrangement it is anticipated that Northern Energy will enter into an agreement with CQPA during the current quarter. Discussions with the Surat Basin Railway consortium and QR regarding rail capacity for the projects are ongoing. Following the Company’s Annual General Meeting in November Mr Geoff Lord joined the board as non-executive director. Geoff has extensive business management experience in a diverse range of businesses including resources In 1990 he established the Belgravia Group, a privately owned investment group which currently employs some 14,000 people. Mr Lord has significant experience as an independent public-company director in both mining and industrial sectors. He is the current Executive Chairman of UXC Limited, as well as sitting on the Boards of Institute of Drug Technology Ltd, MaxiTrans Ltd, MAC Services Ltd, Ausmelt Ltd and KLM Group Ltd. In addition, he recently served as director of listed gold miner Triako Resources Ltd from May 2000 until it was taken over by Consolidated Broken Hill Ltd in September 2006.